Field-Cornet Willie Louw, a guerrilla in the Second Boer War, was shot by the British on this date in 1901. 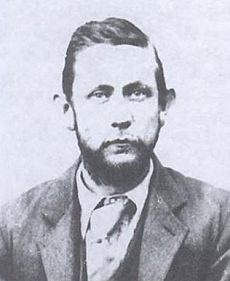 A nephew to the Scots-descended Dutch reform minister Andrew Murray, William Hofmeyer Louw was a Colesberg farmer when that area — part of the British Cape Colony — was invaded by guerrillas from the neighboring independent Boer states. Questions of the right allegiance out on the frontiers of empire were the very heart of the conflict. Louw sought advice from a judge, who advised him that as the Boer Republics claimed his district, he could join them on commando with a clear conscience. When we got home we heard that a sentence was to be promulgated on the market square at 11.30. All were eager to know who the prisoner was and we watched to see the procession pass. Bravely like a man he walked, erect with firm and steady step, his face ruddy and beautiful. It took a very few minutes to read the sentence and when he walked back the colour had not left his face nor the vigor his form — he was unchanged. At about 2 o’clock we were there (at the goal) and found him quietly putting a few little things he had used together to be borne home on a tray by Boezak. The tray away, I put my arms around the strong neck while he bent over me and with his head on my shoulder I said, ‘Als ging ik ook dal der schaduz des doods ik sal geen kwaad vreezen, want Zyt met my, U stock en U staf die vertroosten my.’ (When I walk through the valley of the shadow of death I will fear no evil, for thou art with me, thy rod and thy staff comfort me.) We then sat down, my husband at his right side and I at his left. All that was spoken by him bore unspeakably sure evidence of his trust in Jesus’ merit, of his preparedness to meet his God, of his hope of glory. He told us how thankful he was that he had twenty-nine days to prepare for this — how he had not been alone — how he had been strengthened, wonderfully strengthened … he was so sorry for you Dear Father and Mother and for George and then for us all — but we were to try and be brave and bear this. He had prayed to God to strengthen us and poor cousin Hanni as well. I am returning your last letter to you because I am departing to a better world where there is no grief and sorrow. It is stipulated that I will depart this afternoon. It is God’s sacred will. He cannot make mistakes. May He always be close to you and dearest Daddy and all our loved ones. May He strengthen you all. Yes, God has promised me that he will strengthen you all, now there is nothing, virtually nothing, that worries me or will hold me back. Oh, I wish I could have done more work for Him. What value there is in a single soul. God, our Father, has allowed it all for the glory and honour of His name. Adieu! Until we meet again my own, dearest Mother.